This post is for consideration as part of Cold's Gold Blogging Carnival for November 2012. 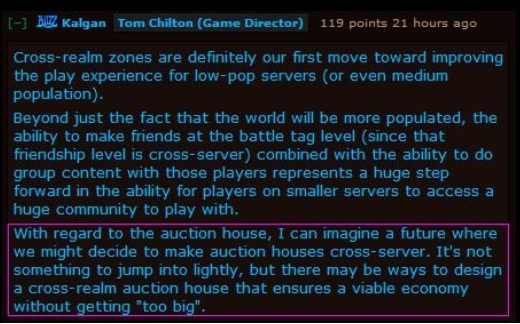 It relates to a blue post from Blizz talking about the possibly of introducing a Cross Realm Auction House (CRAH) and the effect on the economy this feature would have. By combining the action houses, there would be greater Supply of items but there’d be greater demand too. Demand drives prices, when there is an oversupply of something; Sellers are forced to reduce prices to sell their items. The price falls till enough Buyers enter the market to purchase the items. Under a CRAH environment there would be a constant influx of items for sale. A Buyer could almost be guaranteed to find an item they were looking for on the AH. The Raw materials for all professions would be undercut constantly in an attempt to be the cheapest. This is great for Buyers but Sellers would be in constant competition. Margins would be cut to the point that the average wow player would be selling at cost. My main reservations to the introduction of a CRAH would be as follows. One of the tricks gold sellers use to distribute gold is to have the buyer (once they’ve paid for the gold) put 5 stacks of Linen Cloth for example on the AH for a ridiculous price, then the gold supplier buys it out, and 30 mins later you have your gold. The Gold Seller wears the AH fee so let’s say you purchased 5000 gold, you would put up 5x items at 1050 gold (5x1000g + 5% AH fee). You receive 5000g in the mail. A CRAH would mean that Gold Sellers would no longer have to be on multiple realms. They could distribute huge amount of gold from one Server. Remember the duping of Queen’s Garnet in Cata, when the next exploit is found by the Gold Sellers, the CRAH would be a license to make gold for re-distribution. In the meantime all those Low population servers can expect a growth of Bots to supply the CRAH with mats. I hate being ganked that’s why I play on a PvE Realm. It provides the added benefit of being able to explore Horde dominated areas to gather materials without interruption. There would be a distinct advantage of being on a PvE realm for Gatherers to make gold, if a CRAH were introduced. I’m sure we’ve all experience the person who puts up 1000 pieces of Cloth in single units on the AH. I always find this slows down the Auction house considerably, which is probably the primary motivation of the seller. I use an addon called Auctionator to search for items on the AH and when the above occurs, I find that Auctionator grinds to a halt. The main reason I use Auctionator is because I dislike the way the Blizzard UI shows what’s on the AH. 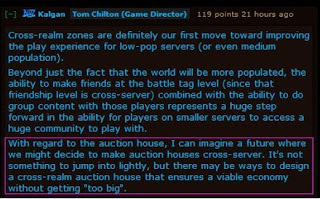 If a Cross Realm Auction House were introduced unless something is done to the UI, I believe the AH wouldn’t cope with the quantity of Auctions. Trying to use the Blizzard UI to buy items off the AH, is an exercise in frustration. Selling items is even more of an ordeal. In 10 years, Blizz have made no effort to make the UI any more user friendly, but have incorporated a No. of other Addons into the game, as features. I say, fix the current AH UI before you go experimenting with Cross Realm AH's. My biggest competition are the no-lifer’s (could be Gold Sellers) who sit on the Auction House 24/7, (Some would say I’m one). These people undercut constantly and dominate an area of the AH. A CRAH would only promote this sort of behaviour, especially by gold sellers. I've got enough competition on 1 server let alone Cross realms. My opinion of the CRAH is that it would be a huge mistake on Blizzards behalf to try and facilitate this feature. Don't fix what isn't broken. I would love to see something like this worked in as part of a real money ah, limit purple to say 5 stacks listed at a time and allow items to be bought and sold cross realm with a large ah cut similar to how the neutral ah works now. This would limit the volume of auctions and generally keep the listings focused on the extremely rare/expensive items where competition wouldn't be nearly as heavy. Think rare patterns tcg mounts rare pets etc. CRAH = kill wow. We like to share ideas and try it on different servers, we like to think about gold making solutions. In case of CRAH no one will share any ideas anymore, everyone would keep the secrets. No one would help the goblin community. Like you pointed out some "no life"r sits on AH 24/7. We learned to avoid them, switch profession, go different server. Bliz would put all this retards together and would give them a GLOBAL control over the AH. What would happen? 3 - imagine the farmers.... they don't spend that much time in AH like crafters or resellers. They would go nuts in 2 weeks, and would stop farming. 5 - the goblins would leave because this is suppose to be fun. We accept little pvp in ah etc etc, but I don't want to fight with ppl every single minute so I would give up. 6 - the whole economy on each server would go down since most of the farmers are quit, same for the AH goblins. 7 - after 1/2 year the subscribers would go from 10 mill to 6 mill or even more (here is a little example: i have 5 friend on the server, 1 miner... spends hours and hours to collect ore, he does not like raid at all, he doesn't want to spend 5 hrs on a wipefest. Another one: he is a scribe: he spends 80% of his time in the AH, milling creating glyphs, he is ok to run regs but no H or lfr, as me I like little bit of LW, BS, Tailor, medium Scribe, heavy JC, after 1 month I have 1 lvl 89, 1 lvl 87, and 2 lvl 86, maxed out 8 profs already, and love to buy/sell things) So let say CRAH comes, well that would be the day when all of us go. Last thing: thank you for TSM team, Auctionator, Autcioner to make wow's AH usable. How lucky we are? Check SWTOR... a horrible AH w/o any option to change the gui. Check Diablo 3... a joke. I played dio3 for a few weeks and I can say 2 words about the AH: EPIC FAIL. Please Blizz don't kill wow with your idea how to cut budget on server. You contract AH's to 1 server proly would save you some $ but on long term you would just kill the whole game. I don't think it would change anything regarding to the gold sellers problem. Imagine: 10 million account, how would you able to spot the gold seller? Some people have toons on both sides and sometimes they transfer money from side to side, the only way you can make it happen if you give the gold to your friend and ask him to buy a specific item in the neutral AH. That's looks like gold selling but it's not. Actually all this gold sellers and dupers, would get into heaven since they would able to sell their doomed items in a few min... No this is really bad idea. You right about selling rare items, but to who? After 1/2 year big part of the community would leave since the AH no longer represents independent economy from server to server and give a nice playground for goblins.